The operation was aimed against the Rur River, as a staging point for a subsequent thrust over the river to the Rhine into Germany. It was conducted by the First and Ninth U.S. Armies. The Rhine is one of the major European rivers, which has its sources in Switzerland and flows in an mostly northerly direction through Germany and The Netherlands to the North Sea. The river begins in the Swiss canton of Graubünden in the southeastern Swiss Alps, forms part of the Swiss-Liechtenstein, Swiss-Austrian, Swiss-German and then the Franco-German border, then flows through the German Rhineland and the Netherlands and eventually empties into the North Sea. The First Army is the oldest and longest established field army of the United States Army, having seen service in both World War I and World War II, under some of the most famous and distinguished officers of the U.S. Army. It now serves as a mobilization, readiness and training command. The Ninth Army is a field army of the United States Army, garrisoned at Caserma Ederle, Vicenza, Italy. It is the United States Army Service Component Command of United States Africa Command. The offensive commenced on 16 November 1944 with one of the heaviest Allied tactical bombings of the war. However, Allied advance was unexpectedly slow, against heavy German resistance, especially in the Hürtgen Forest through which the main thrust of the offensive was carried out. By mid-December, the Allies finally reached the Rur and tried to capture its important dams, when the Germans launched their own offensive dubbed Wacht am Rhein. 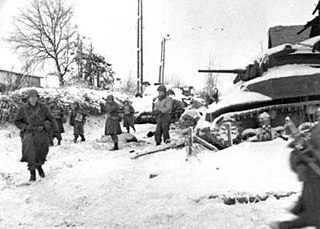 The ensuing Battle of the Bulge led to the immediate cessation of the Allied offensive efforts into Germany until February 1945. The Hürtgen forest is located along the border between Belgium and Germany in the southwest corner of the German federal state of North Rhine-Westphalia. Scarcely 50 square miles (130 km2) in area, the forest lies within a triangle outlined by the German towns of Aachen, Monschau, and Düren. The Rur River runs along the eastern edge of the forest. Lorraine Campaign is a term used by U.S. Army historians to describe operations of the U.S. Third Army in Lorraine during World War II from September 1 through December 18, 1944. Official U.S. Army campaign names for this period and location are Northern France and Rhineland. The term was popularized by the publication of a volume of the same name by the U.S. Army in 1950. 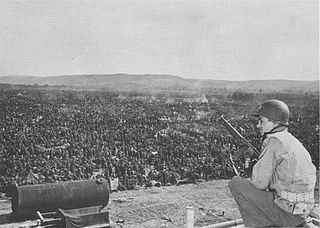 The Battle of Aachen was a major combat action of World War II, fought by American and German forces in and around Aachen, Germany, between 2-21 October 1944. The city had been incorporated into the Siegfried Line, the main defensive network on Germany's western border; the Allies had hoped to capture it quickly and advance into the industrialized Ruhr Basin. Although most of Aachen's civilian population was evacuated before the battle began, much of the city was destroyed and both sides suffered heavy losses. It was one of the largest urban battles fought by U.S. forces in World War II, and the first city on German soil to be captured by the Allies. The battle ended with a German surrender, but their tenacious defense significantly disrupted Allied plans for the advance into Germany. The British Second Army was a field army active during the First and Second World Wars. 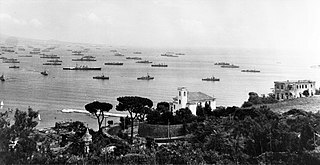 During the First World War the army was active on the Western Front throughout most of the war and later active in Italy. During the Second World War the army was the main British contribution to the Normandy landings on 6 June 1944 and advance across Europe. Linnich is a town in the district of Düren in the state of North Rhine-Westphalia, Germany. It is located on the River Rur, approx. 10 km north-west of Jülich. Jülich is a town in the district of Düren, in the federal state of North Rhine-Westphalia, Germany. As a border region between the competing powers in the Lower Rhine and Meuse areas, the town and the Duchy of Jülich played a historic role from the Middle Ages up to the 17th century. Operation Plunder was a military operation to cross the Rhine on the night of 23 March 1945, launched by the 21st Army Group under Field Marshal Bernard Montgomery. The crossing of the river was at Rees, Wesel, and south of the river Lippe by the British Second Army under Lieutenant General Sir Miles Dempsey, and the United States Ninth Army under Lieutenant General William H. Simpson. The Burma Campaign was a series of battles fought in the British colony of Burma, South-East Asian theatre of World War II, primarily involving the forces of the British Empire and China, with support from the United States, against the invading forces of Imperial Japan, Thailand, and the Indian National Army. British Empire forces peaked at around 1,000,000 land and air forces, and were drawn primarily from British India, with British Army forces, 100,000 East and West African colonial troops, and smaller numbers of land and air forces from several other Dominions and Colonies. The Burma Independence Army was trained by the Japanese and spearheaded the initial attacks against British Empire forces. The Ruhr Pocket was a battle of encirclement that took place in April 1945, on the Western Front near the end of World War II, in the Ruhr Area of Germany. Some 317,000 German troops, consisting mostly of unarmed Volksturm militia and Hitlerjugend units were taken prisoner along with 24 generals. The Americans suffered 10,000 casualties including 2,000 killed or missing. Operation Lumberjack was a military operation with the goal of capturing the west bank of the Rhine River and seizing key German cities, near the end of World War II. The First United States Army launched the operation in March 1945 to capture strategic cities in Nazi Germany and to give the Allies a foothold along the Rhine. The Western Allied invasion of Germany was coordinated by the Western Allies during the final months of hostilities in the European theatre of World War II. In preparation for the Allied invasion of Germany, a series of offensive operations were designed to seize and capture the east and west bank of the Rhine River. Operation Veritable and Operation Grenade in February 1945, and Operation Lumberjack and Operation Undertone in March 1945. Allied invasion of Germany started with the Western Allies crossing the Rhine River on 22 March 1945 before fanning out and overrunning all of western Germany from the Baltic in the north to Austria in the south before the Germans surrendered on 8 May 1945. This is known as the "Central Europe Campaign" in United States military histories. The Battle of Arracourt took place between U.S. and German armoured forces near the town of Arracourt, Lorraine, France between 18 and 29 September 1944, during World War II. As part of a counteroffensive against recent U.S. advances in France, the German 5th Panzer Army had as its objective the recapture of Lunéville and the elimination of the XII Corps bridgehead over the Moselle River at Dieulouard.